Ads are visible on IDELLO when you browse without a subscription. For one, we recommend that you sign up for free on the page. This will give you the opportunity to navigate the website by viewing some resources in full. You will also have access to plenty of video excerpts. How do I get information or technical support? Send an email to idello@tfo.org and describe your problem in as much detail as possible (username, email address, browser used, etc.). If you can, please include one or multiple screenshots showing the problem. How do I become an IDELLO partner? Send us your partnership offers at idello@tfo.org and we will follow up as soon as possible. Internet Explorer: 11, Edge, Chrome, Firefox, Opera and Safari: last two versions. Note that Safari on Windows is not supported. I am a teacher in Ontario. How can I subscribe? If you are a teacher in an Ontarian or a Manitoban school board, you are immediately entitled to an institutional subscription providing you with complete IDELLO content access. Subscribe using your school board email address and select your school board in the institution list. What is the difference between an institutional subscription and an individual subscription? Our various subscription plans and their benefits are detailed on our Subscriptions page. Institutional subscriptions provide access to all of IDELLO’s content. They are reserved for schools, school boards, or other educational establishments that wish to provide their teachers with subscriptions through bulk licenses. Individual subscriptions provide access to all website features and resources except some video content for reasons of copyright. IDELLO is continually working to acquire new content for both subscription types. How do I request an institutional subscription quote for my school board, my school, my preschool, etc.? To request a quote, you must be signed up as the administrator of an institution. Once logged in, you can fill out a quote request form on the Subscriptions page, at the bottom of the INSTITUTIONAL section. An IDELLO customer service agent will follow up with you within 48 hours. Where do I find information about my account and subscriptions? signed in. The Sign In option in the top right corner is available from any website page. 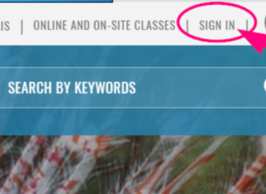 When signed in, you can also retrieve all your information from the Dashboard. How do I cancel a paid institutional subscription? Please contact an IDELLO customer service agent at idello@tfo.org or by phone at 1 844 4 IDELLO (1 844 443-3556). 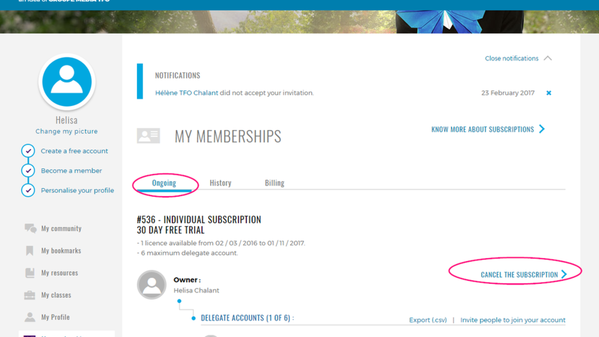 How do I cancel my paid individual subscription? Go to Manage my subscriptions in your profile, then click on Cancel subscription. The change will become effective at the end of the current payment cycle. I am a parent. I would like to have a subscription to IDELLO. How do I proceed? As a parent, you can purchase an individual subscription. The benefits of individual subscriptions are detailed in our Subscriptions page. I am a teacher in Manitoba. How can I subscribe? If you are a teacher in a Manitoban school board, you are immediately entitled to an institutional subscription providing you with complete IDELLO content access. Subscribe using your school board email address and select your school board in the institution list. La recherche avancée est accessible depuis la fonction Explorer les ressources présente en haut de page partout sur le site. Elle s’articule autour d’un menu de filtres performants permettant une exploration simple et rapide. Vous pouvez aussi faire une recherche par mot-clé depuis le champ de recherche Recherche par mot-clé en la combinant ou non à un ou plusieurs filtres. Are resources dubbed or subtitled in English? All IDELLO resources are in French, with only a few exceptions. The subtitles available in the video player only include close captioning in the video’s language for the deaf or hard-of-hearing. However, a transcription of videos is available. 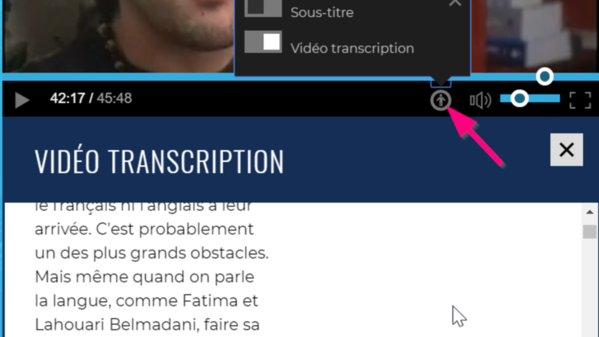 This feature is very useful for French-as-a-second-language learners. These options are available directly in the video player, by clicking on the accessibility icon . Are videos accessible for the deaf and hard-of-hearing? IDÉLLO allows you to create groups of students to share resources and activities with. To be part of your groups, students must above all have an IDÉLLO account. You will therefore first invite them to share the license giving you access to the website. 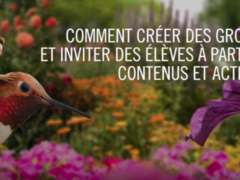 Once they have received a first invitation from you, they will have to create their account and join the group. They will automatically be part of your relationships and you can invite them to join other groups afterwards. When logged in, from your profile menu, under My community, click Manage my groups and invite students. Then click on Create a group. See details in the video below. and enter the group code. Then they have to confirm that the invitation is from you and accept the invitation. Fill in his username and password and click SIGN IN. The student is part of the group automatically once connected. A teacher can change a student’s password without an email address by going to My subscriptions> Select a student and Change password. Why do some videos and websites become unavailable after a while? Some videos and websites featured on IDELLO are subject to limited duration copyrights. They therefore have an expiry date. IDELLO seeks to systematically renew copyrights for resources presented on the site and referenced in some documents, but this may not always be possible for various reasons outside of our control. Can I access IDELLO resources outside of Canada? IDELLO retains the educational broadcasting rights in Canada for all videos presented on the site. Only a select few series and videos have rights for all North America or the World. Please note about 1 500 IDELLO resources are available worldwide using a free account (TFO productions videos, websites, games, apps). and click on Forgot password. 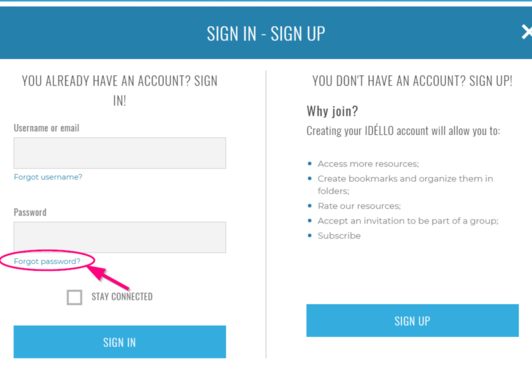 When you sign in to IDÉLLO, you can use either the login you chose when creating your account, or your email address. when logged in, you can change your password from the section Change My Information in the Profile menu. How do I share a resource with a group or on social networks? Every resource page contains the Collaborate icon . It allows you to share resources with a group or on social media like Facebook, Twitter, and Pinterest. How do I add a resource to an activity? How do I create a list with my favorite resources? Every resource page contains the icon Add to my bookmarks . By clicking on it, you can add the resource to your unsorted bookmarks, to one or multiple existing folders, or create a new folder directly. Under My Resources in your profile, you can create folders to organize your bookmarks. How do I create an activity and a quiz to share with groups? Go to My Resources, then Create an Activity. If you want, you can add a quiz to your activity.